NorthBay Cardiac Rehabilitation is a nationally certified program located inside NorthBay Medical Center. The staff works directly with the cardiology team to provide care for patients once they are discharged from the hospital. Patients entering the cardiac rehabilitation program are ready to learn and put into practice the tools they’ll need to live successfully with their heart condition. The program includes exercise to strengthen the heart, nutrition counseling, and lifestyle counseling that focuses on modifying risk factors. 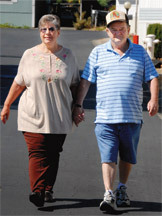 The cardiac patient’s first step toward recovery after leaving the hospital is a visit to the cardiac rehab department. Spouses or other family members are strongly encouraged to join the patient in this visit. They meet the staff and sit down with a nurse to discuss their recent hospitalization, their medical history, their current treatment plan, medications and to learn what their next steps are. “This is often a very emotional time for both the patient and the family, as the visit usually coincides with the realization of what exactly happened ‘hits them,'” Gordon says. Many times, patients enter the program with multiple prior medical problems that have complicated their recovery further. “The typical 40-something male patient of long ago no longer exists. We now see both men and women, ranging in age from late 20s to the late 80s,” Gordon says. The rehab staff needs to find balance between helping the patient face their new reality, and being the first cheerleader for their recovery. Once this is done, goals are negotiated, and the patient is admitted to start working toward recovery. Patients receive a comprehensive education program when admitted to cardiac rehabilitation, which also includes consistent lifestyle changes and exercise. Exercise therapy ranges from eight to 12 weeks, with sessions three times a week for 30 to 60 minutes. The first session includes a functional assessment of their current condition that results in an individualized exercise prescription aimed to strengthen the heart muscle and improve circulation. Along with strengthening the heart, the prescription is designed to improve their strength, balance and endurance so they can do the things they enjoy. Feedback and encouragement from staff is weekly and ongoing. Patients are monitored closely by intensive care nurses with special training in therapeutic cardiac exercise. Heart monitors and oxygen levels are constantly and closely assessed to keep patients safe. In this environment, patients feel secure challenging themselves because they know that they have a safety net in case something unexpected happens. After a few weeks into the program, patients begin to bond with each other. “Our patients find strength in being with others who are going through the same experience and who understand their feelings,” Gordon adds. She also encourages her patients to join North Bay Mended Hearts, an educational and ongoing support group which meets monthly, alternating between Fairfield and Vacaville.